Video Game Mondays – “Metroid II: Return of Samus” and “AM2R” Comparison: Part 2 – Controls, the Landing Site, and the Second Save Point | Jesse Hecht C.R.E.A.T.I.V.E. So now the game begins. 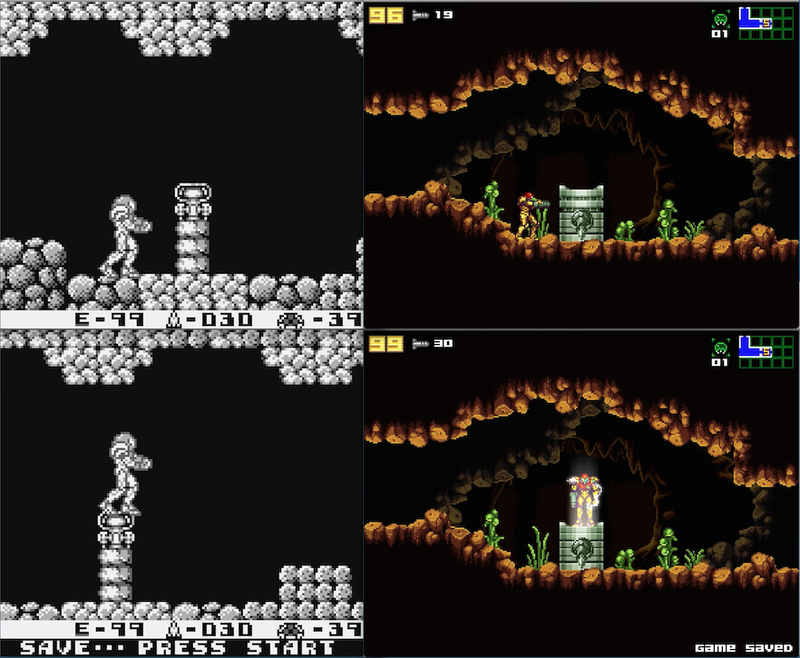 Both games have similar structures, but many differences, both graphical and mechanical, are between them. Samus can also perform a spin-jump. In AM2R, a shadowing aftereffect appears while jumping, and it adds motion and flash to the jump. Samus also has, slower, floatier jumps and controls in M2 than in AM2R where she is faster, and the game compensates well. As far as firing her arm cannon, she has the small, peashooter-like Power Beam and the more powerful Missiles. In Metroid 2 both beam and missiles are slower, but in AM2R, the shots are lightning fast, with more Power Beam shots and Missiles available on-screen than its predecessor. As far as the environments go, they are literally day and night. The screen is a pitch black color in M2, and in AM2R, it’s the early morning or midday. Strange grassy greenery covers the ground and more is added in AM2R, giving the planet of SR388 more life at the onset. Mountains, fog, clouds, and a green sky can be visible in the background, and this is a place that really isn’t seen after this moment (the game is really linear and backtracking isn’t required) so one could be glad that this much detail and effort was put into AM2R’s first screen. The Gameboy game does have its moments of graphical clarity though, but that comes later. Samus’ ship is a masterpiece in both versions and this is the highlight of the first screen in M2. Looking closely, the ship somewhat resembles Samus’ head shape and armor color, showing that yes, this is hers. The ship can be climbed on, and Samus can go into the cockpit in both versions. While the Gameboy game just lets the player go into the cockpit and walk around, AM2R allows the player to save the game’s progress, just like other games in the series, although saving in AM2R is automatic; You’re not asked if you would like to save or not. These are the most deliberate save points in the series, where you actively have to want to save. The ship does slide Samus into the ship if her foot is on it, but the controls in AM2R are so tight that it’s easy to avoid that “trap”. Samus can also perform the Morph Ball function from the get-go: No more hunting for it in the game. What’s more, in this game, it is the “only way to travel” in the way that rolling in Morph Ball form provides quicker locomotion than running, or even jumping around. In fact, jumping is slower than running, which is slower than Morph Ball Rolling. There is an even faster form of locomotion, but that’s getting ahead of ourselves. Samus cannot run underneath the Starship in the original, but she can in AM2R, so that’s a plus. In addition, a Morph Ball Button is added, going from two presses of “down” on the directional pad or analog stick to the press of a single button. This can also help her slow her descent by repeatedly pressing it while falling (Morphalling? ), and it’s useful getting across horizontal distances. 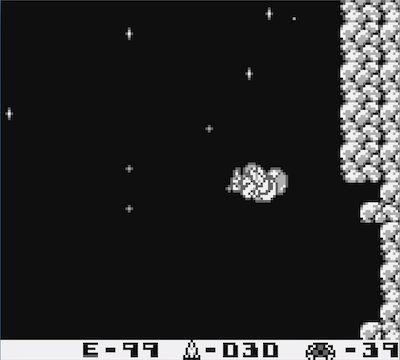 Moving to the left of the ship, in M2, there are two rectangular hills leading to a wall, and in AM2R there is a small slope with an outcropping. The simplified design makes the area more organic. I understand the technological limitations of the Gameboy and the fact that this is an alien planet, but rectangular hills? I commend Guasti for making the area more organic and cutting the hills out, while also telling the player that they cannot go past the wall by adding that outcropping. 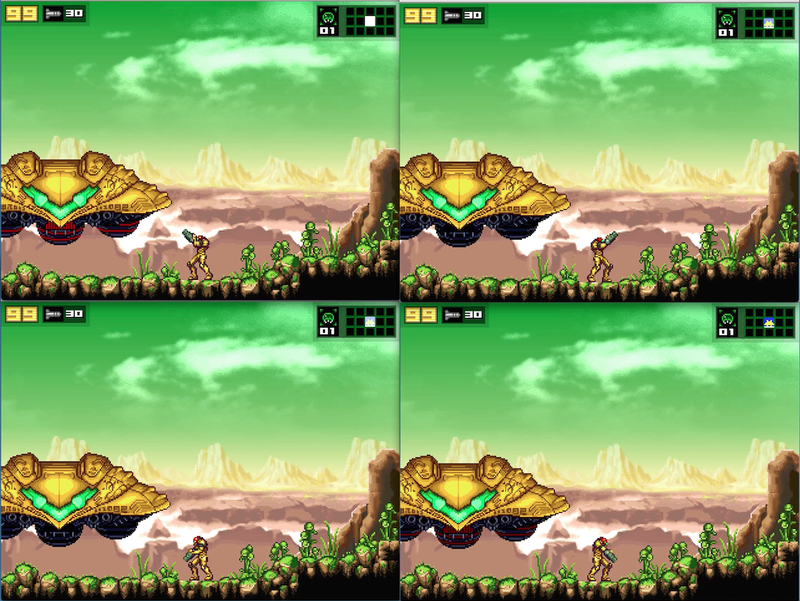 In AM2R, Samus can also wall-jump, allowing her to scale walls with ease. The outcropping on the left prevents her from getting too high up, but on the other side of the landing area, there is a small portion of wall that Samus can scale with the wall-jump. In the original game, she can jump to a small plateau on the rocks, showing that yes, this takes place at night, but this wall in AM2R goes even higher, to a point. This is where we can also discover more of Samus’ traits. Samus can also cling to ledges, thanks to the item, the Power Grip, introduced in the Gameboy Advance game Metroid: Fusion and named in Metroid: Zero Mission. This allows her to grab onto and climb up ledges, as well as climb into small spaces with the Morph Ball later on. Samus can also fire beams and missiles from five directions when she is holding onto a ledge. She’s not defenseless, you know. So that is the current state of Samus’ movement. Samus is now ready to move onto the next area. A cave to the left of the ship seems to beckon her in the original version in a foreboding way, and while it does not take up much of the screen in the new version, the older version gets a point more for this small piece of atmosphere missing in the translation. Maybe having the screen become darker, or having ambient sounds occur when the cave is approached would help the mood in the new game, but here the tension falls flat. The music is also part to blame for this. In the original it is a trumpeting adventuring fanfare (as far as beeps and boops go, this song is great), but in the new one, synths take the lead, giving it a mysterious feel. 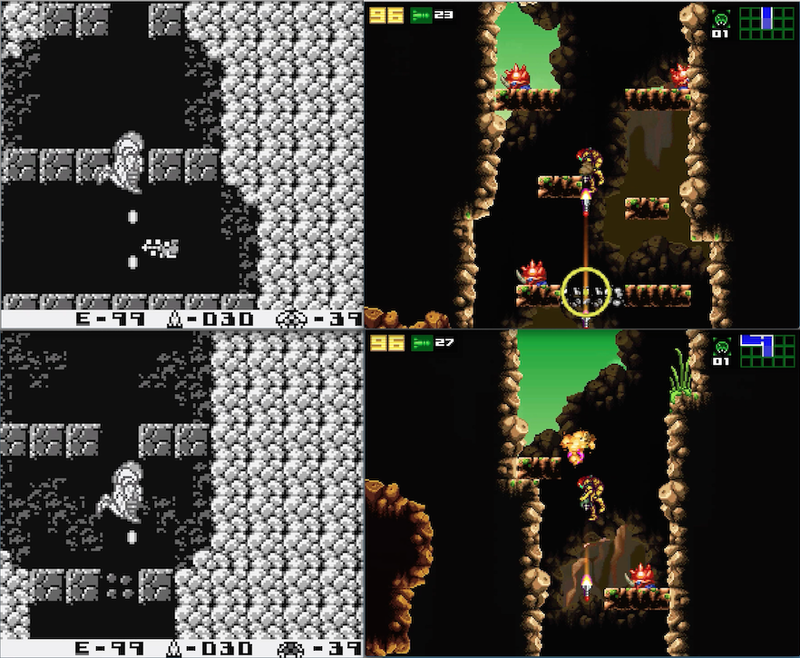 The graphics to music tonal trade-off is understandable, and the music in the new game beckons the player into the cave instead of the graphics that are just too bright for the tension of the adventure. Right out of the gate, Samus encounters two new types of creatures (they’re usually called enemies, but they’re really just fauna of a sort) called the Yumbo and the Hornoad. The Yumbo flies left and right in the air in both versions (and dive bombs Samus occasionally in AM2R) while the Hornoad jumps left and right in both versions (and spits a green glob in AM2R). They both go down in a few beam shots or a missile shot. They’re also given a great design upgrade in AM2R, and aside from the first few minutes of gameplay and one other, they are not seen again They’re easy fauna to fight and give the player a taste of battle, aim, and if she gets hit, mortality. 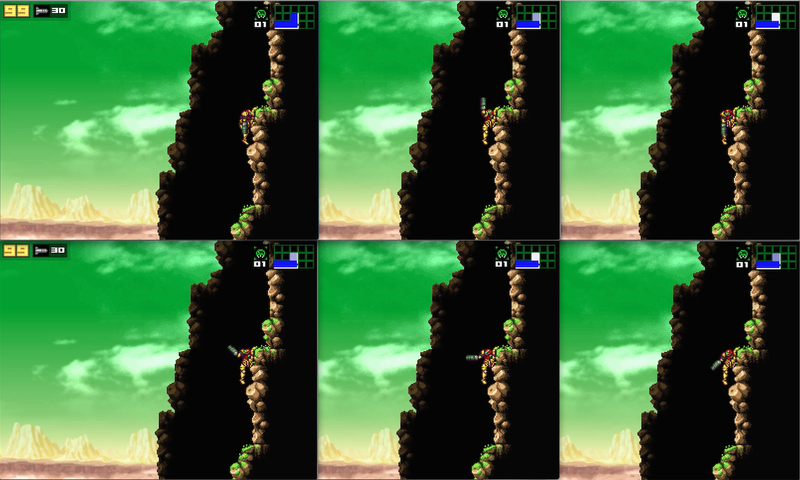 As Samus runs through the corridor and gets hit, we must assess the displays on the bottom and corners of the screen. 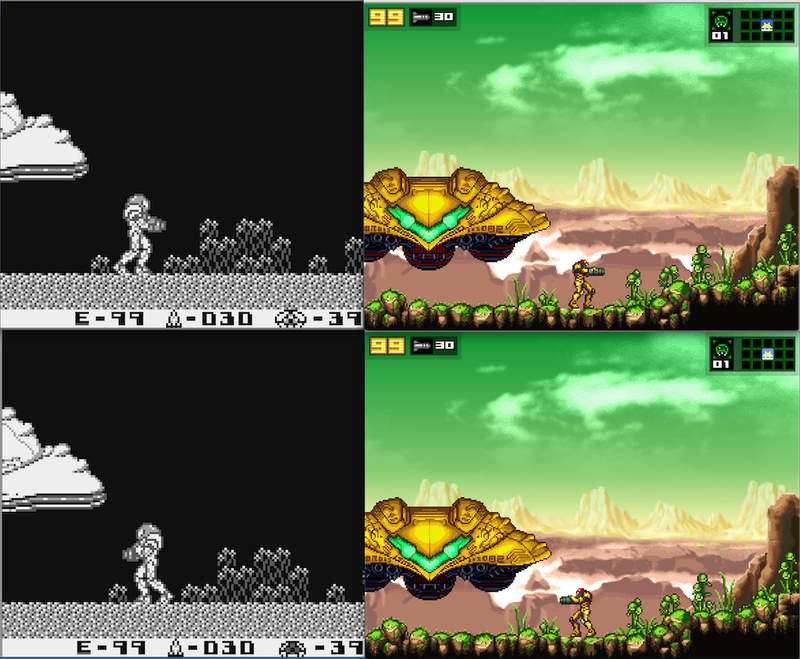 The displays show Samus’ energy, missiles, and Metroid count, while AM2R adds a map in the upper right corners and text readouts in the bottom left and right corners (left for hints and scan readouts and right for game saves), as seen below. At the end of the hallway, Samus comes to a pit. Another “call to adventure” device. The player wonders if they will die when jumping in the pit, after all, the Mario Brothers games originally had death pits and this is a Nintendo franchise. The only option is to jump in with blind faith in the original version, but AM2R compromises with a line-of-sight “lid” that goes over the pit that can easily be shot with beams, or better yet, missiles. Missiles in this game have something called “splash damage”, similar to a “splash zone” at a water park. The missile’s effect extends to damage fauna and objects around the site of impact for an extra second, but this is a “game changer” so to speak. This allows the player to get extra hits on fauna that normally would take extra missiles to put down. When inside the pit, shooting down or diagonally in both or either cases allows to break away the soft ground below. The ground blocking Samus’ path in the original game is covered with cracks, signaling that it is breakable. The “lid” and ground below looks different and more “square” than the rest in AM2R, so it can be deduced to shoot at it. 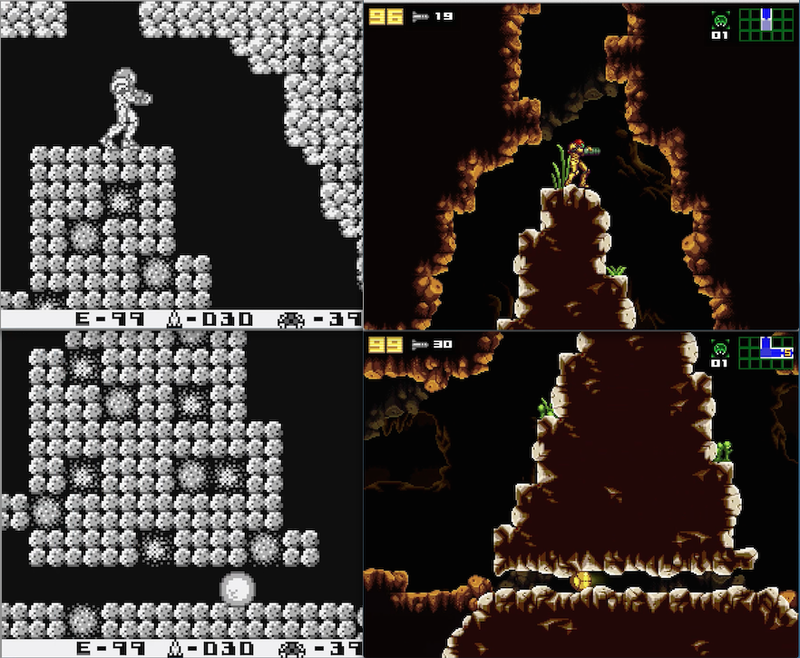 This is the conceit of most Metroid games: if there is no obvious way forward, use the tools at your disposal until there is a way forward. Also, the map at the corner of the screen has a gap at the bottom of it, so the only way to go is down. Another obvious way forward is the small Morph Ball-sized tunnel ahead once Samus reaches the bottom of the pit. It should be clear what to do, but this also shows how to use the Morph Ball if the player hasn’t already used it before. Heading forward, there is a difference in both games. The pit contains no fauna in AM2R, but in the original, Samus is ambushed by a Hornoad as she comes out of the pit. The placement makes it so the player gets hit, but a veteran player will have a quicker trigger finger. Before the next room is revealed, Samus can also take a quicker shortcut in AM2R, a tunnel located near the “lid” of the pit. Several of these shortcuts will be in AM2R, and this comparison will cover all of them. The next room is horizontal and tests the player’s ability to shoot downward. It’s easier to shoot down with the beam in the original game, but in AM2R, missiles are a better choice. The splash damage kills fauna and breaks apart the rocks below, but be warned: a constant firing rate is recommended. Samus also encounters another fauna that is in most of the Metroid games: the Tsumuri. Wait, that isn’t a Geemer? Apparently this is a case of same fauna, different name, because the Geemer and the Tsumuri have M.O.’s that are one and the same: walk along every surface. That’s all there is to them, and it’s fun to dawdle and trap them along one surface, but Samus has a mission. They take a few beam shots or a missile to defeat. They’re also markedly different in both games. Blockier in the original and having a horn and spikes in the new game. Touching enemies in videogames hurts the player character for no reason, but at least cause-and-effect of touch = pain is clear in AM2R with the Tsumuri. When she lands, Samus stands on a large mound of rock. She can go either left or right. Either way, there is a morph ball tunnel underneath in both versions. Hidden in the new version, and surprisingly present in the original. Going up the mound isn’t that bad (tedious at best) but it’s nice that both versions have a shortcut. The detailing on both mounds and the surrounding rock is also a nice touch and very welcomed. Most Metroid games start with left being the viable option, but right is, for some reason, the direction to go in this game. Right it is. Samus comes across a pedestal in both versions, the pedestal being detailed with the head of a Chozo in AM2R. Standing on top of the Save Pedestal in AM2R will automatically save your game while the Gameboy Save pedestal will ask you to save or not. Saving is a valid option right now, and Samus continues right, next time on Video Game Mondays. Next > Jesse Hecht C.R.E.A.T.I.V.E. was on Hiatus!